How Clive saved Christmas | Mary-Lou Stephens. One of our journalists sighed. Loudly. My family consists of The Hubby, The Dog (Maddie) and The Niece, and The Niece had just accepted an invitation to go camping for two weeks including Christmas Day. “I could possibly go,” I said. The Hubby and I have a Christmas tradition. Breakfast on the beach. We live on the Sunshine Coast in Queensland. It’s summer. Our Christmas breakfast on the beach consists mainly of prawns. People eat lots of prawns in Queensland at Christmas. I’ve queued for hours to buy them in the past; in stinking heat, in pouring rain – until I discovered that the fish shops stayed open all night to cope with the demand. One year I did a late night run and waltzed straight up to the counter, no queue, no crowds. After that our preferred time to buy Christmas prawns is midnight. Easy. Clive Palmer is the richest man in Queensland, a multi-millionaire by the time he was 27 thanks to real estate. He retired but none of his friends were as rich as him so he got lonely. He went back to work buying up iron ore rights in the Pilbara instead of condos on the Gold Coast. His millions turned to billions and now he was hosting a Christmas lunch for hundreds of needy people at the resort he bought on the Sunshine Coast and is turning into his own playground with vintage cars, Titanic memorabilia and the first of many life-sized dinosaurs. 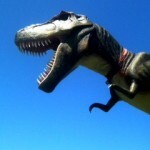 Others in our team had been out to see Jeff the Dinosaur and to cover other head-line grabbing Clive Palmer stunts but I hadn’t been to the resort since he’d bought it. I was curious and The Hubby and I had no lunch plans. The Hubby was a little harder to convince, he likes a lazy Christmas, but after I told him Clive’s PR man had said we could leave whenever we liked, he acquiesced. And just as well. The Hubby said he’d look after the late-night prawn run on Christmas Eve. I was dozing when he returned after midnight. “No luck with the prawns,” he said as he slid into bed. We both lay in the dark, hoping that Clive would have prawns. The next day, instead of our traditional Christmas breakfast of prawns on the beach we had Stollen with marzipan (an impulse buy from the Swiss bakery the day before) and a cup of tea on the patio. We gave The Dog her Christmas present which she ate with gusto. She eats everything with gusto. Except, ironically, prawns. The Hubby and I opened the one Christmas present we’d bought for each other (more on that in my next post) and played with it for a while. Then we slipped into our Christmas clothes and went to Clive’s. Jeff looked magnificent as we drove past him on our way to the car park, even more impressive than the photos and videos I’d seen. He was in the swing of the festive spirit with a Christmas bell around his neck. At the press conference, I asked some questions, took some photos and experienced first-hand that curiously amusing and infuriating Palmer manner. Then The Hubby and I went into Christmas lunch with hundreds of other people bussed from the Gold Coast, Brisbane and the Sunshine Coast and everything provided for free by Professor Palmer. Yes, he’s a professor as well, of sorts. It was a buffet lunch with roast meats, cold meats, baked fish, salads, roast vegetables, smoked salmon, freshly baked bread rolls and tables laden with all kinds of desserts for later. We pulled crackers and put on silly hats, chatted with our companions on the media table and waited our turn to join the line to pile our plates high with Christmas cheer. My eyes scanned the cold section of the buffet. There, amongst the bowls of lemon wedges, seafood sauce and thinly sliced salmon were those scavengers of the sea. The Christmas delicacy we love to eat all year round. 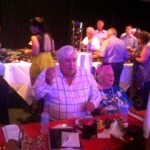 This entry was posted in Blog and tagged Christmas, Clive Palmer, mary-lou stephens by Mary Lou Stephens. Bookmark the permalink.